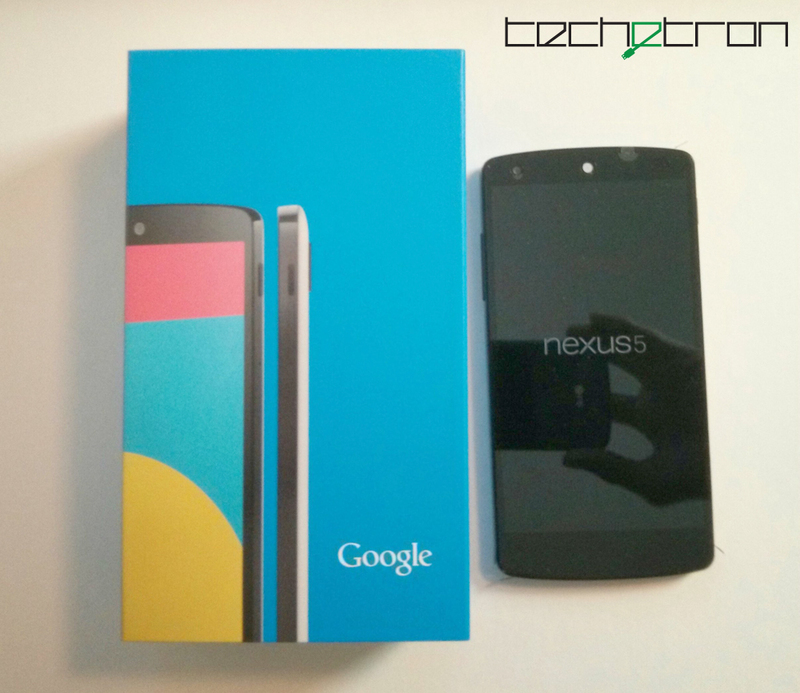 It’s finally here – after months of being teased on the internet, I finally have the Nexus 5. I was able to snag a white 16GB off the Play Store on release day before it all went out of stock. (Current orders placed will be shipping within 3-4 weeks according to the site). The blue box itself is unassuming and nicely designed showing part of the phone on the bottom left, and the Google logo placed on the bottom right. Blue seems to be the theme this time around. Underneath the holding for the phone is a blue cover. And under that is an instruction card with a SIM remover attached to it. There are other cards in different langauges showing the location of various interfaces such as the power, SIM tray, volume, NFC and USB. I used the little pin to remove my SIM from my Nexus 4 and inserted it into the brand new Nexus 5. Upon handling the phone, I immediately realized two things about the phone – one of them is the obvious bigger size of it, while being thinner than its predecessor. 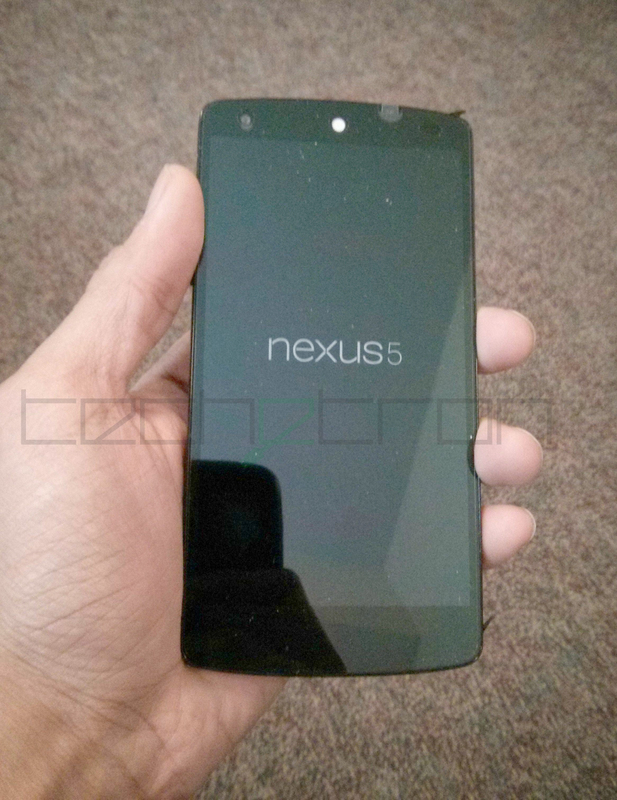 And while the weight difference is only a few grams, you can still tell the Nexus 5 is lighter. 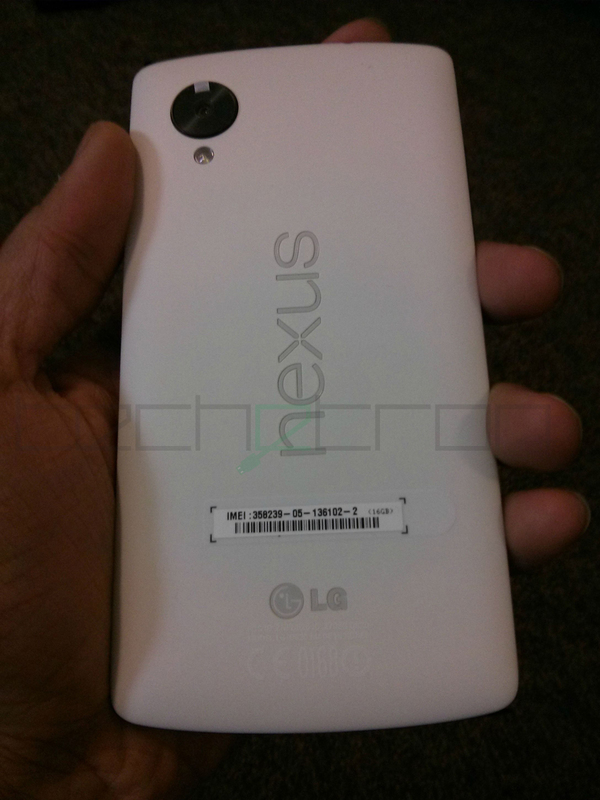 I like the fact that it’s not as rounded as the Nexus 4, and along with its slimness it just looks all the more sleeker. I find it to be the best designed Nexus phone so far, and I’m glad that they replaced the glass back that was in Nexus 4 (I’m kinda tired of worrying about cracking it further than it already is – without much help from me). The back feels very smooth under my fingers and though, the glass back seems to provide more friction. This might be because of almost a year of use, though. The phone speaker is located at the top center, and very visible as its white like the back, although pictures on the internet show it to be black on both versions of the phone I’m guessing it corresponds with the color you chose. The front 1.3 MP camera is located to the left side on the same level as the speaker, while the sensor is on the right side. There is a LED indicator at the bottom of the screen, though you can’t really unless it’s blinking. The volume bar is on the left side, just like last time and the power above the SIM tray on the right. The back has the Nexus logo engraved, with the camera sticking out just a little bit on the top left with the flash right underneath. The existence of the IMEI number just above the LG logo engraving is kind of annoying though and gets in the way of the beauty of the design. The power button is a little more tactile on this phone and easy to reach. Upon signing in with my Google ID, I’m prompted to restore the device from my account. I affirm and pretty soon Google has downloaded all my apps onto my phone. 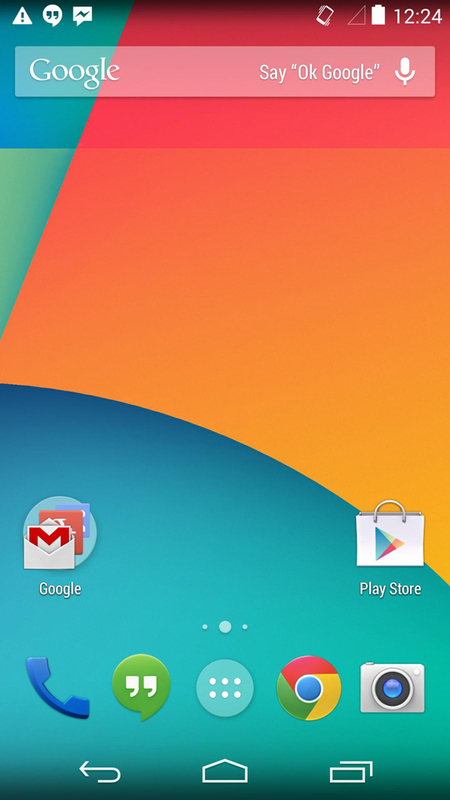 I finally start to experience Android 4.4 KitKat. The tutorial lets me know two of the biggest update on KitKat: Google Now is now located on the left-most screen of your home screen and Hangouts now handles messaging and SMS! 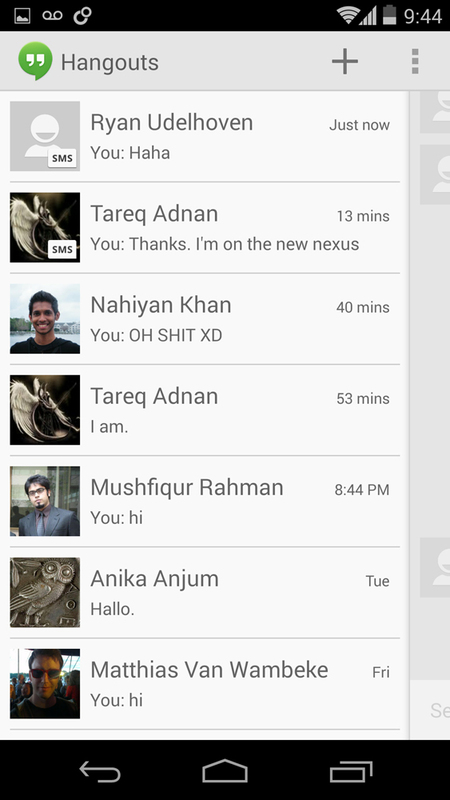 So I figured I would try the new Hangouts first. I was in for a few surprises and not all of them pleasant. Creating a new message loads up all your contacts, those on Hangouts are shown in green while those youcan text have a little SMS icon next to them – you can of course search through all your contacts and select whether you want to send them a message on Google or through via SMS. It’s definitely a good direction, though, and I can’t say I’m displeased with it. I just keep wishing for everything to develop a chat heads system (though this can be done through a custom ROM called Halo) so that the user would never have to switch out of an app to reply to a message. As I was messaging a friend, who uses an iPhone, we discovered some improvements of the app. Upon using an emoticon, he promptly says that’s the first time that he received actually received it from a non-iPhone instead of just the codes. We figured that the app has finally decided to translate the codes and display the emoticons accordingly. They won’t always look the same though as the designs for the two OSes are different, but still it’s a nice little improvement. I decided to check out what Google Now had in store for me on the KitKat. I found the swiping to right mode of access really comfortable and preferred as opposed to pulling up the home button, which still exists. The first thing to greet me was my next immediate calendar appointment and the next one was the availability of the soundtrack of Doctor Who Christmas special episodes by Murray Gold on account of me watching videos by the artist on YouTube, followed by the Weather. 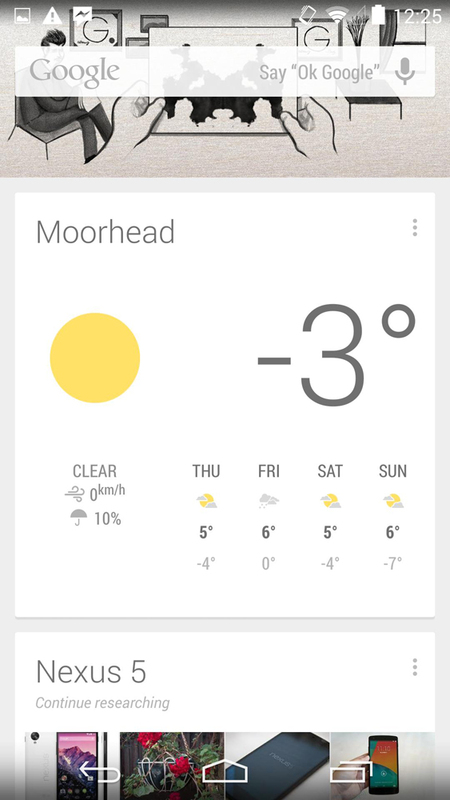 At the bottom is an icon that takes you to a Customize Google Now page which wasn’t there before. It lets you set addresses for Home and Work and set certain options regarding those locations. You can also set reminders and check out upcoming or past ones. News will appear on your Google Now based on other stories you may have read (and this syncs of course among your devices when logged in through Google). I usually am not one to run a benchmark test but Mushfique seems to think it’s a good idea so I did. I used the AnTuTu Benchmark app and the score came up to be 27031 with a caption that says “Great!’ Presented on a bar chart, my device seems to be on the 3rd after the Galaxy Note 3 and the Galaxy S4. 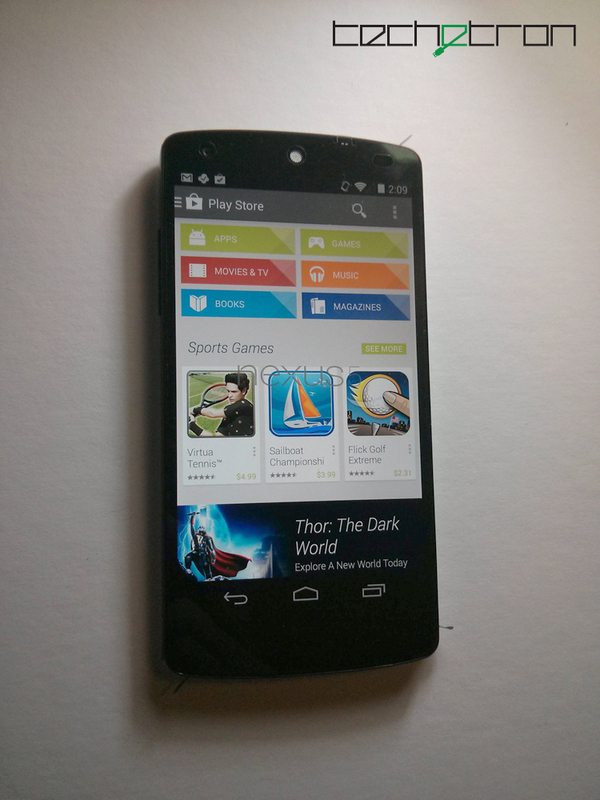 Using the Nexus 5 feels great. I’m not constantly on edge about potentially cracking the back glass because there is none. And although it’s a little bigger than its predecessor, it still manages to fit snugly in in my palm. I played around with the camera just a bit (more to come) and tried taking some macro pictures. The shots speak for themselves. I took a similar shot with the Nexus 4 for comparison on the improvement of this flagship device. We will update with more pictures later on, so keep tuned in. Overall, the Nexus 5 is a great phone and if you don’t mind being signed in to Google, enabling location services and generally allowing the search giant to absorb info, KitKat serves plenty of relevant information, though not everyone might be okay with that. For the very reasonable price of $349 and $399 for the 16GB and 32GB respective, this is a great phone and I definitely recommend it if you’re going for an Android phone. It’s a great looking phone, seems sturdy and performance is blazing fast all with the Nexus brand. You can’t really ask for much else from.